News Was that the worst Golden Globes in ages? Mixing dark humor and heart with a unique, original storyline, the third season of the half-hour comedy, Hung continues to revolve around the unorthodox efforts of divorced teacher and baseball coach Ray Drecker (Thomas Jane) who generates extra cash by selling his best "asset" to women. The beautiful collector's box set is designed with the sigils of the four main houses and comes with a premium dragon egg paperweight, a Blu-ray bonus disc of season two, episode one, as well as all of the bonus materials and interactive features from the original DVD and BD releases. This limited edition set is the perfect gift for any Game of Thrones fan! Boardwalk Empire was the winner of eight 2011 Emmy(R) Awards, including Outstanding Directing for a Drama Series (Martin Scorsese), and the 2011 Golden Globe(R) for Best Drama Series and Best Actor (Steve Buscemi). In season two, Nucky and his lieutenants appear to have solidified their hold on power by rigging an election and getting a crony elected mayor. When a resourceful international terrorist group plots a major attack involving a cache of weapons of mass destruction, a charismatic former U.S. Special Forces operative joins forces with a stealth British military unit to stop them. Set in exotic locations such as India, South Africa, England and Chechnya, the series is headlined by two rising stars: Philip Winchester as Michael Stonebridge, a British sergeant on the elite counter-terrorism team; and Sullivan Stapleton as Damien Scott, a former U.S. Delta Force operative who was disgraced and discharged on the eve of the U.S. invasion of Iraq. Centering on Treasury Secretary Henry Paulson, the film goes behind closed doors to examine the symbiotic relationship between Wall Street and Washington. Directed by Academy Award winner Curtis Hanson, the film features an all-star cast lead by Academy Award winner William Hurt, Emmy and Academy Award nominee Paul Giamatti, Academy Award nominee James Woods, Emmy(R) winner Cynthia Nixon, Topher Grace and Billy Crudup. 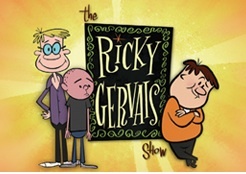 The Ricky Gervais Show animates the podcast that first appeared on the Guardian website, subsequently earning a spot in the Guinness Book of World Records for the most downloads. In March 2011, the podcast reportedly passed the 300 million download mark. Topics covered in season three include: Karl ruminating on museum collections, his invention of the mug coaster, a movie pitch, and Karl, Stephen and Ricky shedding new light on charitable causes.